Planting material conisists of seeds as well as plants that are reproduced vegetatively (from parts of a parent plant, such as cuttings and root divisions). In other parts of the world farmers have started ‘seed saving’ groups. 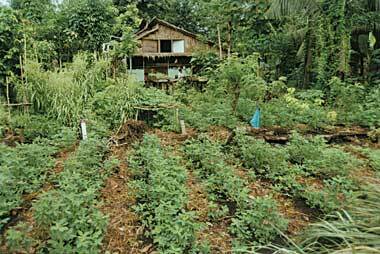 In solomon Islands many of the most important staple crops such as sweet potato, taro, yam, cassava and slippery kabis are all reproduced vegetatively. So when farmers got together under kastom gaden to discuss how they could look after their varieties of plants they formed the ‘Planting Material Network’. …and then these planting materials are distributed to members. Members are encouraged to contribute seeds and planting materials back to the Network for multiplication, propagation and redistribution. The PMN Honiara seed production garden produces about 1000 packets of high quality open pollinated seeds every month and maintains a seed bank for access by members. To become a member of PMN or if you are already a member of PMN click here.